The Harman P68 is the most powerful of the Harman range of pellet stoves, winning the HPA 'vesta' award in 2004. It says a lot for the efficiency of the accordion heat exchanger that Harman feel it only needs a 135 cfm. distribution fan to transfer all that heat. It's a step top and pedestal design with the ability to add a hopper extension, increasing the capacity to 136 lbs. and the burn time to 136 hrs. The Harman P68 has a mirror glass viewing window which permits a good fire view when the stove is operating. When the stove is off, the mirror glass presents a reflective surface. This stove produces 68,000 btu. and is capable of heating an area of over 2,200 square feet. It has the Harman room temperature probe and the exhaust heat sensor. The room temperature probe speeds up or slows the stove down to compensate for temperature change and takes frequent readings of temperature trends. The exhaust heat sensor adjusts the stove according to the quality of fuel being burned. Heating Area More than 2,200 sq. ft.
Max. Heat Output 68,000 btu. Rear Vent Height 10 in. Hopper extension adding 60 lbs. to 76 lbs. Empty the ash pan. Clean and scrape the burn pot, clean the heat exchanger, clean ash from the inside of the stove, clean the combustion blower fan and internal flue. Inspect and clean the flue if necessary. Check the door gasket for leaks. 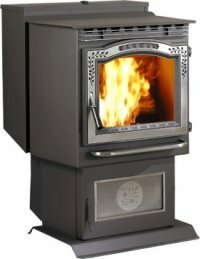 If you would like to leave a review of the Harman P68 pellet stove, please use the form on the contact page.